You just have to go over and check out Sockbugs 57 pairs of socks! It’s a great shot. AND she’s got loads of links to sock patterns too! No excuse for not finding something interesting to knit here. 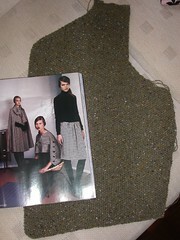 Although I think I’m going for the Falling Leaves pattern from Knitty next. Mist is moving along slowly but surely. Finished the left front this afternoon and have cast on for the right front…then it’s just a sleeve to go! The houndstooth capes and skirt are from September Vogue. Have always loved houndstooth! Here’s a shot from Catimini’s latest collection for kids. Their baby stuff is adorable. 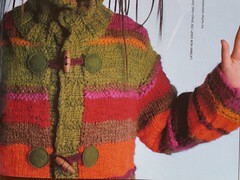 Love the colours and the texture of this jacket.